Gujarat is one such state in India where the Stepwells, which were used as a pond for water conservation, are the heritage sites. Stepwells took the most elaborate and monumental form only in Gujarat. Mostly Stepwell in Gujarat are five-six storeys, each level tells a story that lead to a well. In the bygone age, the main work of Stepwells was to supply the water. In a state like Gujarat, where water was hard to find and preserve, these Stepwells plays the role of an important civic structure. Due to its significant role in the life of people, all these Stepwells are crafted to glory by the best artisans and craftsmen. 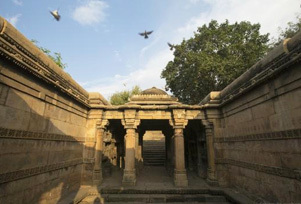 Ramkund Stepwell in Bhuj, Adi-Kadi Vav and Navghan Kuwo in Junagadh, Dada Harir Vav in Ahmedabad, Helical Stepwell in Vadodara, Rani Ki Vav in Patan, Brahmaji's Vav in Khedbrahma and Adalaj Stepwell/Adalaj Ni Nav in Gandhinagar are the prominent stepwells in Gujarat that have carvings and ornamentations with beautiful sculptures. Apart from helping with water supplies, these stepwells have religious significance as well. Adorned with beautiful sculptures and frescos at each step, it will be a deliberate sin for tourists to ignore these Stepwell on a tour to Gujarat.